Tru-Fab Technology is a "metal-fabrication shop with the ability to do a lot more," according to company president (and welder/machine operator) John Stegh. Its pair of waterjet-cutting machines consistently leads customers to the door, so much so that a third machine may soon be on order. 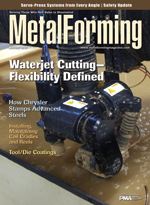 Once this laser-cutting job shop identified the opportunities for waterjet workheavy plate cutting, machining and even nonmetallic workit believed it could easily justify bringing waterjet cutting inhouse. ...evolves to meet the challenges, and opportunities, afforded by the growing use of advanced high-strength steels in automotive body-in-white structures. ...and throw it out the window, because servo-driven mechanical presses are becoming the rule, not the exception. As a result, the rules of the stamping game have changed, forever. ...and the proper methods of installing and maintaining them. Beset with galling and cup tearing, Penn United Technologies sought a solution for drawing stainless-steel cups. The metalformer found one: a physical-vapor-deposition (PVD) tool coating. ...you just have to be smart enough to learn from others." What you don't know can hurt your bottom line. Ermaksan Fiber Laser Lands at Premier Tool & Mfg.